Now we need to tell the report where our data really is. 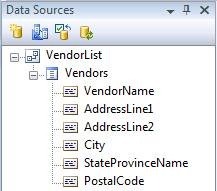 To do this, we’ll tell it to bind the Vendor data table from the VendorList data source to the dataset we generated in the step above. 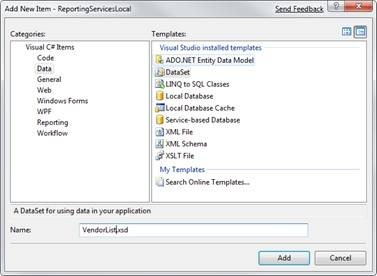 And there you go, you too can now easily create nice looking reports from your existing ADO.NET datasets. Hi, I don’t speak in english but I’d like to know something…I tried to do this example, but I have a trouble…When I do click on the Button DataSet, I have a ErrorMessage that say me this: “Se ha producido un error durante el procesamiento local de informes. yo tenfo ese problema como lo solucionast? Thanks! I’ve been looking for a simple way to do reporting for ages. 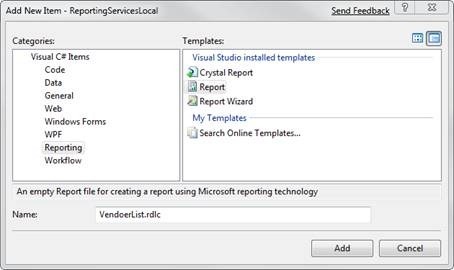 All the examples are to do with running reporting services, rather than this local mode. Great starter article. I just wanted to add a few things that might be helpful to folks wanting to do more advanced reports. When you have multiple datasets(really just tables), you need to be able to distinguish fields from them. With tables/matrices/lists there is a property DataSetName that you can set to the name of your dataset. Be careful, the Report Designed sometimes obliterates this property when you add new datasets. 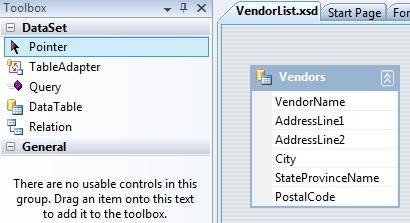 For textboxes, you have to use the First function where the first argument is the Fields!.Value and the second argument is the name of the dataset, e.g., =First(Fields!City.Value, “VendorList_Vendors”). When you want to have dynamic control values in the header/footer regions, you can’t reference dataset fields directly. Most folks put secondary controls in the report body, tie them to the dataset fields, hide them and then tie the header/footer controls to the hidden ones in the body. That’s sort of sloppy and I’ve heard it doesn’t always work properly. A better way is to directly manipulate the xml in the rdl/rdlc files and then calling the the LoadReportDefinition method like so: b.	viewer.LocalReport.LoadReportDefinition(new MemoryStream( System.Text.ASCIIEncoding.ASCII.GetBytes(xDoc.InnerXml))); where xDoc is an XmlDocument object with the modified rdlc xml. Now you can have truly dynamic headers/footers. For optional report sections, many folks use subreports, but I’ve heard that can be slow. Instead, I put all of my report sections inside Rectangle controls in the report body and manipulate the xml once again. Depending on what sections the user wants to see, I cut out the unwanted sections and adjust the elements based on the cumulative elements. Be careful: the report designer usually removes the element for the top-most control (when it’s located at position 0,0) and the element for the bottom-most control. I hope this helps out some folks who want to do some cool stuff with client-side RS reporting. Also, set the BorderStyle to None for the rectangle controls (report sections). I followed the steps mentioned in the article and was able to get desired result. However, I learned that once the report has been loaded with the data it doesn’t change the value. My requirement was to add a text box along with the button to refresh the report. when user put some integer value in the text box and hit the button the data should be refreshed by using that integer value as filter (where clause in the query (variable: qry here). Since the rvwMain.LocalReport.DataSources is a collection the report implicitly takes the first added source as the source to refresh the report in subsequent button clicks. To resolve this issue I just cleared the DataSources collection of the LocalReport to get the desired result. Just thought share it with everyone hoping that it might help the readers. Muchas gracias por el ejemplo, ¡me fue de gran ayuda!